Spain’s economic problems now form part of such a complex web of cause and effect, action and reaction, that it is getting increasingly difficult for laymen, journalists and politicians alike to get to the core of what is actually happening. As it happens, they don’t, as a quick look at what happened in Argentina in the 20th century would confirm. But Argentina is arguably an isolated case, and the current economic malaise (I hesitate to use the word “crisis” due to the duration of what is so evidently an ongoing process) seems to be far more general. What people seem to find hard is asking themselves one simple question, “but what if this time really is different?” Which is strange, since reasons for thinking that things may well not return to what was previously considered “normal” are not in short supply. For several sovereigns in the Eurozone (European Economic and Monetary Union), the financial strains caused by shifting demographics are being compounded by the current economic and financial troubles, which are both strangling growth and increasing the need for social safety net spending. This environment can result in tighter financing conditions amid private-sector deleveraging, plus cuts in public investment leading to a reduction in total investment and consequently the stock of capital. At the same time, the decline in investment activity will likely hurt total factor productivity (a measure of an economy’s technological innovation). Adding to these adverse trends, low employment and net emigration from several sovereigns implies a smaller contribution of labor to future economic growth, a continuing threat if unemployment becomes structurally high. I have recently established a dedicated Facebook page to campaign for the EU to take the issue of the Euro Area accelerating population imbalances more seriously, in particular by insisting member states measure movements of their own national populations more adequately and also by having Eurostat incorporate population migrations as an indicator in the Macroeconomic Imbalance Procedure Scoreboard in just the same way current account balances are. If you agree with me that this is a significant problem that needs to be given more importance then please take the time to click “like” on the page. I realize it is a tiny initiative in the face of what could become a huge problem, but sometimes great things from little seeds to grow. I am certainly no fan of inflation targeting. The last five years is evidence enough for me to question its merits. But if the BOJ has a 2% inflation target does that not put an effective floor on currency debasement and, by extension, the risk of Argentine style capital flight? What exactly is the mechanism here? Japan is now too old to get inflation (cutting the long story short), so they will never reach a 2% sustainable level and will continually have to keep debasing to keep trying. The main issue I see arising is that markets aren’t positioned for the inability of the BoJ to get inflation. This is due to some sort of old school monetarist dogma they all seem to believe. At some point the BoJ either throw the towel in on the continual devaluation due to pressure from the G20, or markets cease to believe they can get inflation. This latter is the black swan event I am expecting. Then the consequences will be outside rather than in Japan, since a huge misallocation of resources is taking place. Basically I would expect to see immediate repercusions on the price of Italian bonds (among a lot of other things), since if Japan can’t melt away the debt, what chance does poor old Italy have? First of all thank you for writing these articles. I’m a regular reader. For the most part I understand the general effects of aging populations on growth and inflation. However, I have trouble connecting the dots when it comes to your prediction or warning of the potential instability of Yen due to the aggressive measures taken by the CB of Japan. It would seem to me, that devaluation of Yen is closer to one-off than continuous devaluation. One must take into account that even after these monetary measures, Yen is now vs the $ only where it was in 2009 and lower than before the financial crisis. I have trouble wrapping my head around the prediction that a successful 2% inflation would somehow convince the Japanese to dump yen. Right now, as inflation around the world is falling and chronically below target, it seems peculiar to me to accuse or warn against the governments of debasing currencies. What is debasement if not inflation – which is low and falling – and devaluation vs other currencies – which only Yen is experiencing, and plausibly only as a one-off? “It would seem to me, that devaluation of Yen is closer to one-off than continuous devaluation”. Well don’t worry, you are not alone. Maybe George Soros and I are the only ones who can see and are willing to contemplate this possibility. Feels like a theoretical equivalent of the Alamo. Think of VAT rises. They are a one off. They enter the data for a year and then disappear. 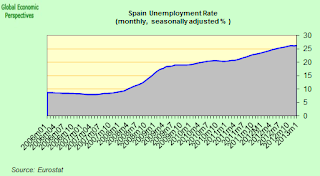 This is what is about to happen in Spain as the country now heads for deflation in September. Inflation shocks only generate ongoing inflation if there is “pass through”, that is if the demand side pressure on a capacity constrained economy keeps the inflation moving, otherwise it simply fades like a very temporary erection. So Japan did get some inflation in 2009 following the oil price surge, but lack of demand soon saw it disappear again. And please note, the Yen is now down around 30% against the Euro (and 25% against the US dollar) since last July, yet Japanese deflation actually accelerated in March, despite the fact that exports are improving even while Japanese competition in Asia and the US pushes Germany near to recession. So even a large-ish devaluation isn’t working yet. The problem is – and that is what this post is all about really – you need quite a bit of macro theory background to be able to assess the validity of the arguments on one side or the other in this debate. I don’t know if you can access my Facebook, but I have a draft article up there which at some length tries to explain my reasoning. If not I will have it up on Afoe during the week. It’s about whether the neoclassical growth model is valid, and if it isn’t what kind of “normal” path can we expect in Japan. Essentially you need to go beyond simple “liquidity trap” or “balance sheet recession” type material and ask whether Japan can ever really “deleverage”. If it turns out that it can’t what are the implications for the Italian situation, since the new prime minister seems to have just broken out of the blockade and headed out to open sea to try and match Japan’s debt levels? At the moment markets are happy, and Italian yields are falling, since they think the Japan experiment will work, and everyone can nicely “financially repress” their debt. Part of the problem here is that the financial economy now really is globalised, and markets are basically moving on one “grand narrative” (Abenomics) which makes the dots quite hard to see even for those who would like to join them up. They are now more diffuse than ever. “While supporting a rise in exports, a further impact of a weaker currency was to raise the price of imported raw materials. Latest data showed that average input costs rose for the fourth month in succession, and at the sharpest rate in over a year- and-a-half. Margins subsequently remained under pressure as a net fall in output charges was recorded for the twenty-first month in a row”. There just isn’t the domestic demand there to generate sufficient pass through even to get short term inflation, let alone generate and sustain a 2% annual inflation rate. This is what i write in my last post! Read it! The money creation mechanism in Eurozone is not just incomplete – it is absent. It is not long to wait for “voting battles” at ECB Council. Therefore Germany pressures Latvia to join the Eurozone to have one more Northern vote. It will be an enormous mistake by Spain and Italy to allow Latvia to join the Eurozone. The cost of EURO exit by large countries is overestimated. Such an event unavoidably will lead to break of the Eurozone, and immediate declaration by all countries that EURO is not anymore payment means in their jurisdiction, to avoid accepting the worthless EURO which everybody will try to unload. This will lead to extinction of pension insurance, but will avoid bankruptcies of states and banks, because they have indebted in currency which is worthless at that moment. The larger issue will be – what happens with 0,2tn EUR in Russia and all the EUROS in China. This can be politically extremely complex.